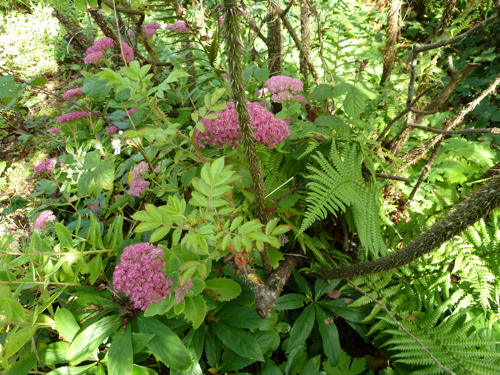 You may recall this picture of part of the right hand rose bed with Sedum Autumn Joy underplanting the Rosa 'Grootendorst' with fern Dryopteris filix-mas I showed you last month. If you look closely at the bottom you can see hellebore leaves – this is where the tiny winter border is – sandwiched between the base of the rose and the path through the pergola. Maybe as much as 60cm wide and a meter long. 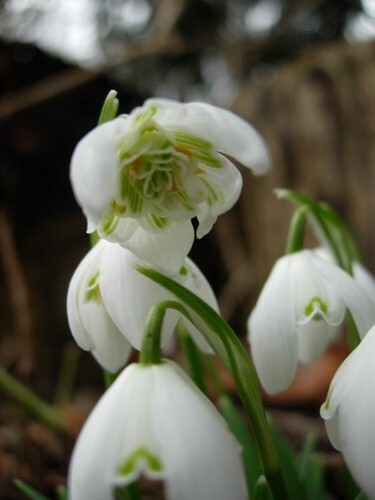 My idea was to see small jewels of winter interest as I walked down the path during January, February and March. It is bounded to the right of the picture above by grass and some birdsown holly giving an evergreen back drop, and on the left of the picture by the path through the rose garden. 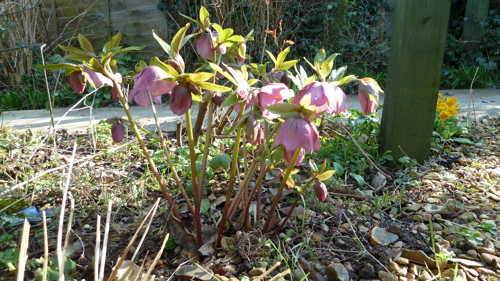 Here is a shot from the hellebore towards the path showing you the extent of the patch. The hellebore – a seedling from the original division from my step-mother’s Helleborus orientalis – is planted against the diagonal path through the rose garden. 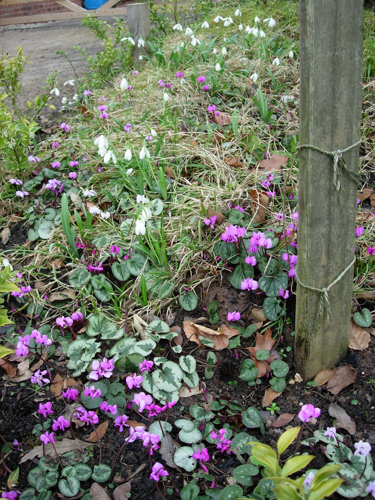 The green post you can see is the pergola post at the edge of the path, and the yellow flowers to the right are a lovely primula (or polyanthus) that my friend Mary brought me which flowered almost 10 months of the year – here it is on 4 March 2011. On the other side of the path is a big clump of Epimedium perralderianum that also came as a division from my step-Mother’s garden, and are planted between the Philadelphus ‘Sybille’and the Weigela ‘Bristol Ruby’. 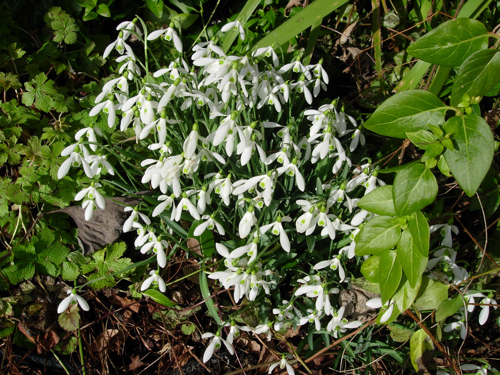 Thus as you walked down the path there was a sudden patch of winter interest on both sides. 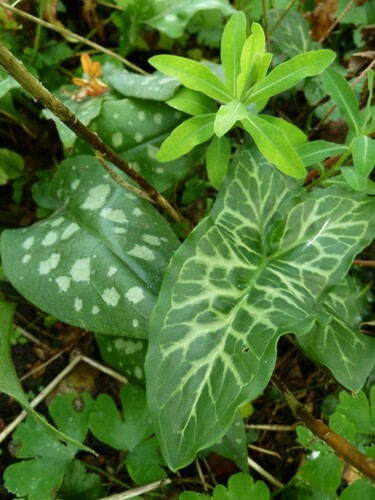 Incidently, I grow the Epimedium in quite dry shade under the shrubs for its glossy evergreen leaves (the young leaves are bronze-tinted), but sometimes the yellow flowers get hidden by them and I have to do some judicious rearranging and snipping to expose the flowers. Over the years the patches have spread slowly to be about a metre in each direction. 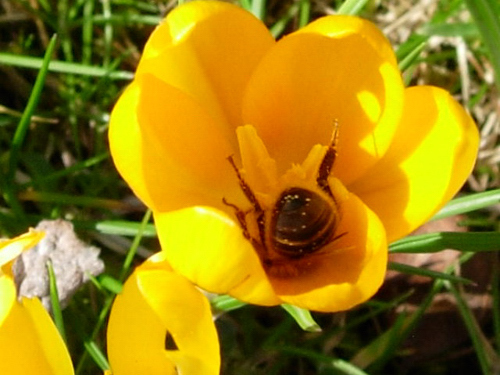 However my step-Mother cuts all the leaves off hers in winter and you see just the wiry stems of yellow flowers in her beautiful winter/spring borders with aconites/snowdrops and other winter flowerers around them. Her clumps are consequently tiny. Her garden in the Lakes is wetter than mine, and her soil more enriched. Which approach do you take? This picture showing the large clump of Galanths nivalis with a frond of evergreen periwinkle leaves on the right and the leaves of the Geranium macrorrhizum ‘Ingwersen's variety’ nestling on the left. 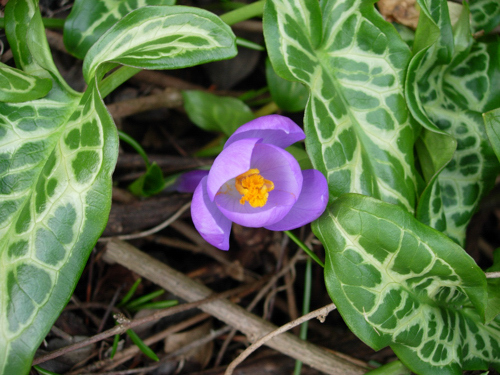 Cyclamen coum – such lovely leaves all year, and then the flowers! 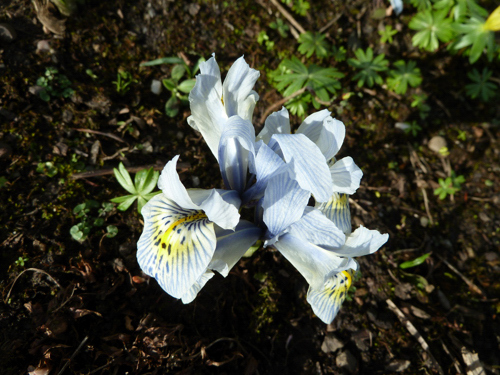 Iris ‘Katharine Hodgkin’ (Reticulata) looking stunning in its faded blue glory! 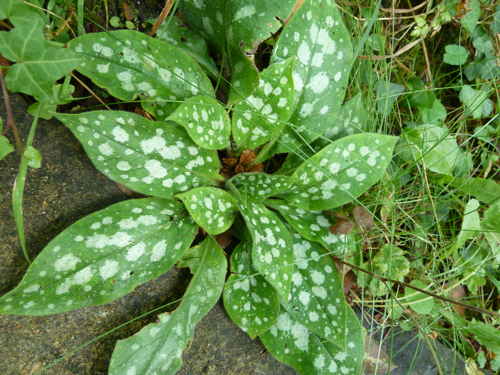 You can see the evergreen leaves of other plants in the photos above, but as well as the arum for winter foliage, I have a couple of pulmonaria plants in there too. 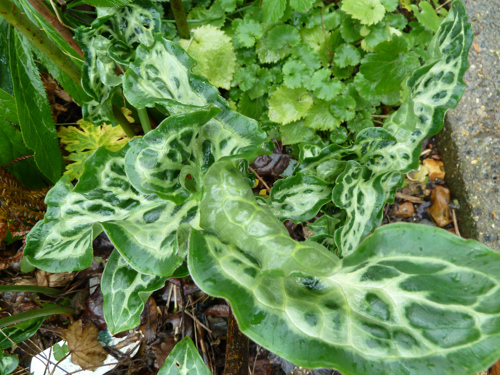 Their foliage is lovely all year as you can see below – the arum and the pulmonaria both had leaves out this September. 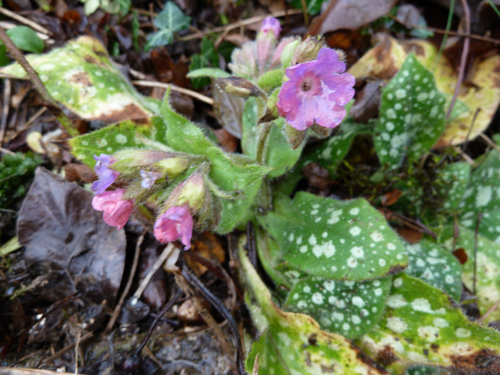 Now I believe this may be a special pulmonaria I bought from Lyn Miles who when we visited in 2012 showed us some of the plants she held on behalf of the HPS pulmonaria collection. However, as you can see, I am not a very good hardy planter as I have lost the label, and did not make a plan/note in my diary either. Any suggestions you have of what it is would be much appreciated. And that paragraph contains two telling points the first of which is “growing elsewhere in the garden.” Apart from the Tete-a-tete none of the other miniatures lasted long in this tiny bed. The other is “on my knees sniffing”. 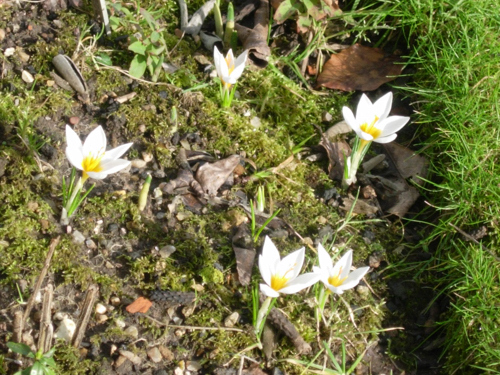 As Stephen Lacey put it in an article once “The wonderful scents possessed by the season’s dwarf bulbs are lost unless you can raise them to nose height. 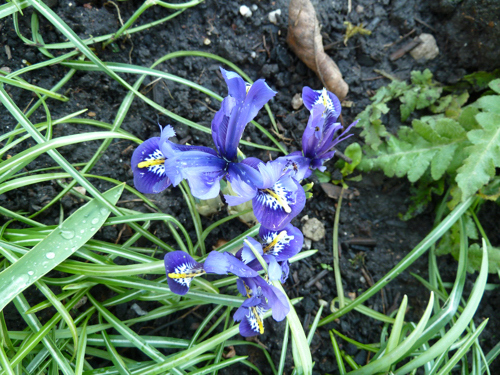 Snowdrops (honey and vanilla)…., crocus (honey)…, Iris reticulata (violets).” Unlike Stephen I am loathe to cut snowdrops in flower to put in vases in the house to appreciate their scent, so I get very muddy knees. 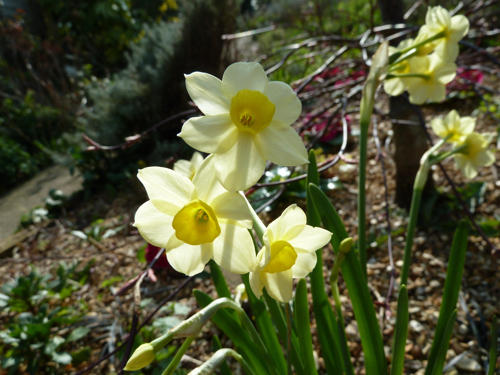 Over the years I have added other garden features which I will tell you about in due course which help to bring some of these bulbs nearer to the nose to appreciate their scent as well as their beautiful flowers. Next time, getting a greenhouse, and making a hotbed. 0 Comments To "On a Chalk Hillside February 2018"